Summer is one of my favorite seasons in Japan. Between all the festivals, the fireworks and seasonal food and drinks, there’s a lot to love, especially in Tohoku! By now, you should know that Tohoku has a really special place in my heart no matter the time of year, but summer shows yet another side of the region that shouldn’t be missed. I had a chance to explore the natural beauty of Yamagata Prefecture, diving deep into the area’s wild side to chase some gorgeous waterfalls (and a few other beautiful bodies of water)! Perhaps best known for world class ski resorts and as the stomping grounds for “ice monsters,” the towering Zao mountain range hosts a variety of picturesque landscapes that are just as impressive in the summer. 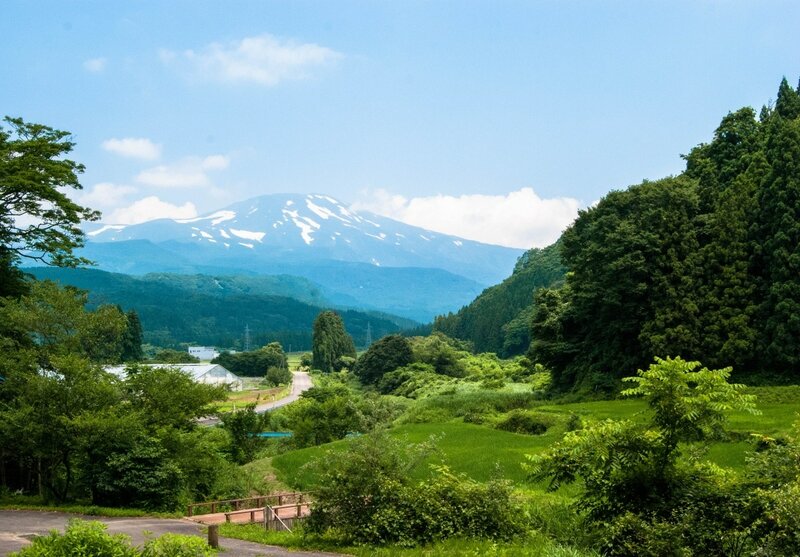 Not even the toasty, Japanese summer can knock the snow off Tohoku's peaks! My first stop was an emerald green pond called Dokkonuma. The pond derives its name from the Japanese word tokko (独鈷), which is an ornate, club-like implement used by monks in Buddhist rituals. Perhaps an ancient explanation for the area’s volcanic activity, a local legend has it that an angry dragon used to live in the area but was banished by a devout monk. That same volcanic activity is what gives the water its characteristic color! The area serves as a lodge in the winter, but in the summer it’s the perfect place for a quiet walk or a relaxing picnic. There’s also Maruike pond, also referred to as Maruike-sama. Surrounded by dense forests alongside a nearby shrine, it feels a little like stepping into a fairy tale. Fed by a natural spring, the depth of the pond is quite shallow at 3.5 meters (about 11.5 ft), which played an important role in its history. Fallen trees and branches were “enshrined” by the water and said to resemble dragons resting on the pond’s floor. But what about the waterfalls I mentioned? There’s the Ninotaki Valley, which offers nature enthusiasts an extended hike alongside a series of cascading waterfalls. While I personally didn’t venture very far along the trail, the soothing sound of running water was good company on the way to the fall I scoped out. I would love to go back in autumn to hike the whole thing and see the leaves as they change color. Then, of course, there’s the Tamasudare Falls. 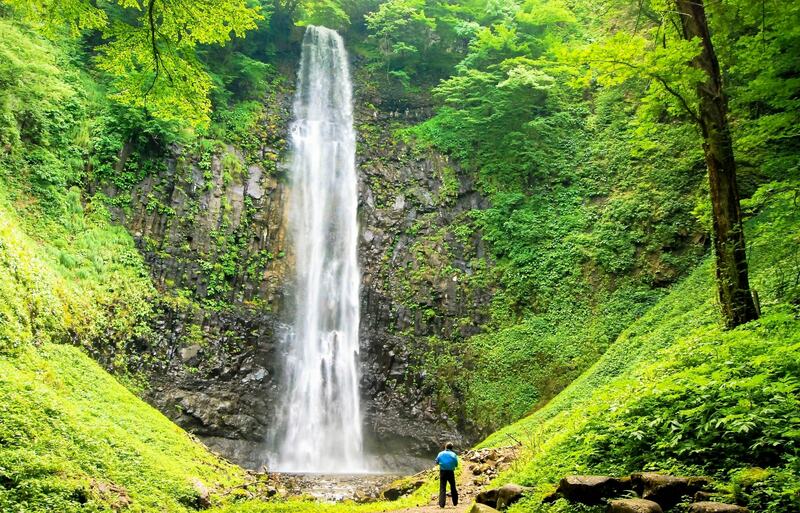 As the largest waterfall in Yamagata Prefecture, Tamasudare spans an impressive 63 meters (about 206 ft) and runs over rock formations created by the volcanic activity of the nearby Mount Chokkai. Tamasudare (玉簾) is a type of hanging screen from which the falls derive their name, thanks to the effect of the water falling into the river below. Although I wasn’t around at night, the area is illuminated after dark in August to celebrate Obon, the Buddhist festival to honor the spirits of one’s ancestors. I would be remiss if I didn’t mention my stop at the Okama Crater, located near the summit of one of Zao’s secondary peaks on the border of Yamagata and Miyagi Prefectures. Named after its resemblance to an okama (お釜), a traditional Japanese cooking pot, the lake in the caldera has an unbelievable color thanks (again) to volcanic activity and must be seen to be believed! And these stops are just the tip of the iceberg! Tohoku has more nature than you can shake a stick at, no matter the season. Visit AAJ’s hub for all things Tohoku and start planning your trip today! I still live in Kawasaki, but I work in the AAJ office now as the English editor. I spend most of my free time studying, reading comics, watching movies and gaming (video, board and tabletop). I love to travel, eat good food and drink.